*The 2014 edition of “Saturday Night Live” got off to a rousing start with Drake as host and musical guest. It was also the debut of Sasheer Zamata. Zamata, 27, is the first black female cast member since Maya Rudolph’s 2007 exit. As far as we’re concerned, Drake did himself proud. He was self effacing and charming and his acting skills were on point. And we’re already warming up to Miss Zamata. In short, they got the job done. During the show’s cold open, the cast took shots at scandal-ridden Chris Christie, Alex Rodriguez and Justin Bieber on a “Piers Morgan Live” parody. Drake’s first appearance on the show was as the delusional former Yankees player, who in the skit blamed autocorrect for the hundreds of damning text messages that suggest he used steroids — again. But it didn’t last long, and morphed quickly into a bar mitzvah skit. This was also the first glimpse we got of new cast member Sasheer Zamata, who played Drake’s not-actual-auntie Rhonda. 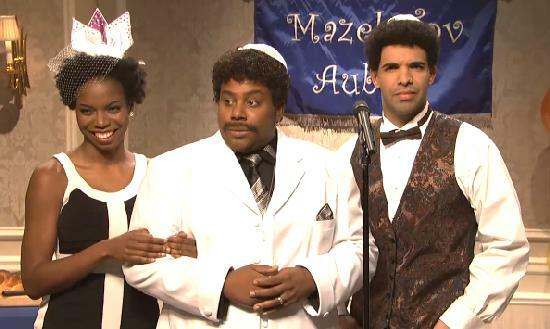 “Mazel Tov” was the first of what promises to be many lines for Zamata in her run on SNL. Seemingly in active response to complaints of lack of diversity, this week’s show hit the ground running with a BET show sketch about what hip-hop stars did before they were famous. Drake as Lil’ Wayne playing Steve Urkel on the early years of “Family Matters” was a crowd pleaser, as was “That’s So 2 Chainz,” which apparently holds the record for the most bleeps on a Disney Channel show. Get the FULL story on “Saturday Night Live’s”2014 debut show at the TheWrap. He was great in the musical performances, even if the girl was out of tune for a minute, she got it together.